In the kitchen junk drawer (does everyone have one of those?) sits a rubber band ball that has grown just larger than a baseball. I found a purple rubber band from the asparagus on the table and stretched it around the ball. As usual, I thought of The Mickey Mouse Make-It Book from which came the idea to make a rubber band ball. I was six then. We didn't have hundreds of rubber bands in the house. Not being able to make the ball immediately, I gave up. Fifteen years ago I wrapped a couple rubber bands around some used aluminum foil. I added bands as I found them. The ball grew but lacked bounce because of the foil core shortcut. I tossed it in the bin as a thing begun badly, but the idea lingered. When the kids outgrew them I packed my Mickey Mouse books in a tote but lingered over The Make-It Book. I saw the things I had made. Some worked, others not so much, and one, the rubber band ball, still called to me. I wound two rubber bands together to form a tiny ball. 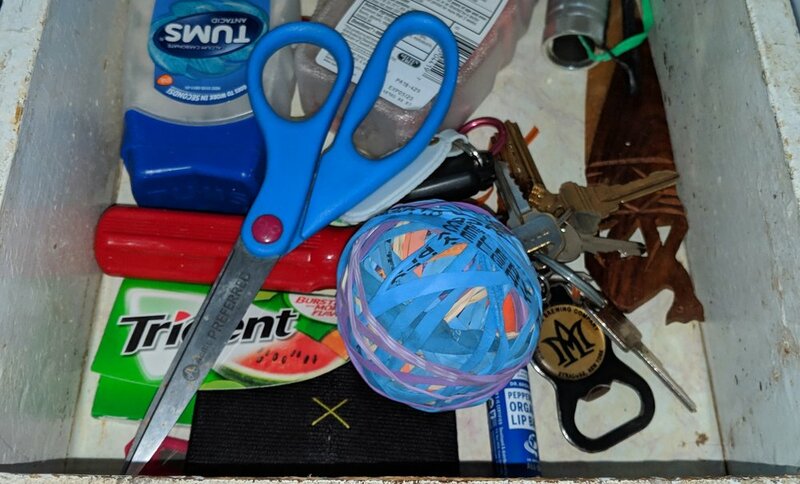 I added the half dozen bands lying in the junk drawer. I added rubber bands as I found them, winding each tightly around the core. Sometimes I thought of the book, the aluminum foil failure, the idea of what I was making, but mostly I wound the band I happened to have around the ball in the drawer. In my basement nook is the tote of comics and Mickey Mouse books. Without digging into it for the Make-It Book I remember most every page, especially the rubber band ball project. In the white space I should write that these things take time, patience, and the art of forgetting, letting go. My grandchildren would do well to learn that, but maybe such things can't come straight out of a book.